In print manufacturing as it’s practiced today, one of the first questions asked of any solution is, how scalable is it going to be? Whether it’s an integrated production line, an internal workflow, or a customer-facing e-commerce system, the ability to ramp up or ratchet down in the correct response to changing volumes has become a key criterion for deciding whether or not the solution is worth investing in. The same goes for printing trade shows. When participation in them declines, they have to be able to demonstrate that the shrinkage doesn’t mean a diminished experience for the exhibitors and attendees who still choose to come. This requires making adjustments and accommodations that let a show operate on a smaller scale without diluting its value proposition to either group of customers. Among other things that it demonstrated in its 2016 edition, Graph Expo has shown that it understands how to be scalable. 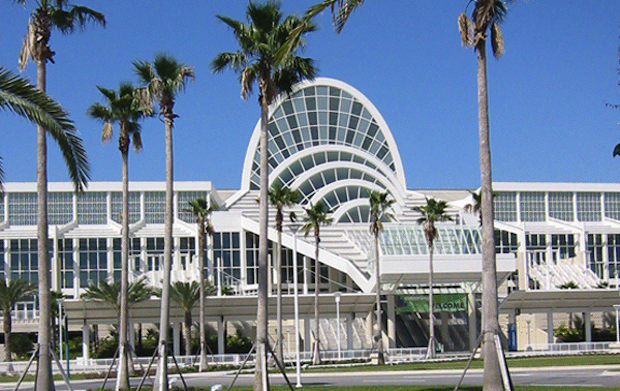 By relocating to a new venue—the Orange County Convention Center (OCCC) in Orlando, FL—the show put itself in surroundings that fit its smaller dimensions flatteringly, like a bespoke suit. The exhibit hall in OCCC’s North Concourse didn’t provide the kind of room that Graph Expo is used to occupying Chicago’s McCormick Place exposition center, the show’s traditional location and the one to which it will return next year. But, the closer quarters in Orlando proved to be an advantage. The 375 exhibitors listed at the show’s web site—down slightly from the 400-plus reported last year—got the space they needed in an environment that was sensibly laid out, easy for showgoers to navigate, and conducive to the kind of flow-through that the vendors count on to bring traffic to the stands. Nor did right-sizing the space mean having to water down the educational and networking opportunities that help to drive attendance at Graph Expo and its quadrennial sister event, the Print show. The four-day (September 25-28) lineup of educational sessions, co-located events, and special-interest areas on the show floor was similar to what it has been from year to year in Chicago. The character of Graph Expo as a focal point for market intelligence has not changed—if anything, it stood out with greater clarity in the more compact setting that the show tried on for size in 2016. Last year, Graph Expo drew 17,941 verified attendees—visitors counted only once, regardless of number of days they spent at the show or number of times they entered the hall*. Forecasting the size this year’s crowd was made trickier by the fact that Graph Expo took place shortly after two other major industry events, Labelexpo Americas and 2016 SGIA Expo, with which it vies to some extent for attendance. Figures for 2016 are yet to be released the Graphic Arts Show Company (GASC), the producer of the Graph Expo and Print events. Unofficially, though, the head count looked solid enough to vindicate GASC’s choice of OCCC as the event’s new home away from home. A good omen was the room-filling turnout for Executive Outlook, a series of management briefings that precedes the opening of the exhibits on day one. As it usually does, Graph Expo opened on a Sunday. In Chicago, this can be a gamble for the show if there is a marathon or a major sporting event in town. In Orlando, the potential weekend competition for opening-day attendance came from the city’s world-famous tourist attractions and its lingering summer weather. These distractions, however, didn’t stop a very respectably sized crowd from massing at the entrance of the exhibit hall for the noon opening. This initial surge kept the aisles well populated for the rest of the day. From what we could see, and from what we were told by exhibitors we asked about booth traffic, attendance kept up more or less at this level for the remainder of the event. GASC personnel we spoke with seemed pleased with the outcome and confident that the move Orlando had been the right thing to do. The show company is not abandoning Chicago—Graph Expo will be back in McCormick Place next year, as will Print in 2018. But, exhibitor unhappiness with the venue’s high costs and restrictive union work rules demanded at least a year’s worth of relief, and Orlando’s OCCC was identified as the facility most capable of providing it. In it, says GASC, exhibitors get well maintained, clean space, a friendly, attentive staff, and a more favorable cost structure than what prevails in McCormick Place. Food courts, cab stands, and other amenities that help to shape the show experience do not disappoint. The show company also sees the Florida location as an opportunity to draw fresh attendance from outside the Chicago area and attract the new audience to the Windy City when Graph Expo returns to its home base. GASC plans to bring Graph Expo back to Orlando in 2019. If the show has the good fortune to be larger then than it is now, scaling up should be easy. With 2.1 million square feet of space in three enormous concourses, OCCC is second in size only to McCormick Place among U.S. exhibition venues. The extra room will be there to grow into if 2019 turns out to be a year of expansion for the show. WhatTheyThink was on hand for Graph Expo in Orlando from start to finish. Watch our dedicated site for reports and videos on highlights from what ought to be remembered as a worthwhile and satisfying edition of the show. *For 2015, GASC also reported a grand total of 23,615 non-verified attendees (anyone who registered, regardless of whether they actually came) and a daily count of 23,068 attendee-buyers counted each day they visited the show.